Tortellini, kale and Italian Sausage all nestled up together in just about the most perfect soup you can imagine. Perfect for cool nights, or hearty lunches, anytime you need to feed hungry people really. Tortellini Soup is so good! My friend Kelly made this tortellini soup for our May Faire a few weeks back, she made 18 quarts of it, I didn’t even get a bowl. It was that good. 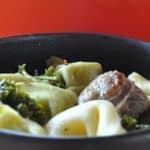 Tortellini tucked in with sausage surrounded by tons of good for you veggies makes even the pickiest of eaters happy to have a bowl. It was so popular people came back and bought second bowls, yet somehow I still didn’t get a bowl. Luckily Kelly likes me and she gave me the recipe. Shhh don’t tell her but I’m going to give it to you. I’m passing it on because if you want to introduce your kids to kale, this is the perfect recipe. It’s there, but the soup is so good they won’t really notice until they’ve eaten it all and ask for more. okay, this looks down right delicious! I cannot wait to give it a try. We have tons of kale in our garden, and now I know how I'm going to use some of it. This looks delish!